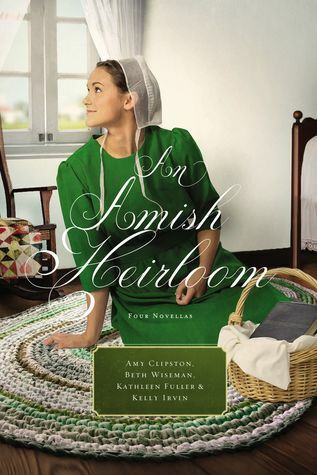 An Amish Heirloom is a collection of four novella Amish stories written by four distinct voices in Inspirational Fiction. I enjoyed reading each story for the characters, spiritual encouragement and the stories that unfolded in each novella. While they were short, they felt like a good length every evening to read. This is a collection that I would recommend reading. A Legacy of Love is written by Amy Clipston and her ability to craft a story is very unique. The reader finds themselves immersed into the story of Leon who is having a difficult time believing he could ever love again. Susie realizes she wants to marry someone, but her intentions may be for the wrong reasons. Following God isn't always easy, but it is better than making a lifelong choice that could end up in heartache. Is Leon able to find love again? The Cedar Chest is written by Beth Wiseman and this one will tug at your heart. This story is great as we meet Catherine who has been struggle in her marriage and finds some old letters. Through the letters, Catherine learns that she can work through all difficulties if she has faith. Wiseman does a fantastic job between bringing the reader in the present and also the past while writing this story. The Treasured Book by Kathleen Fuller is about Shane Broyles who isn't happy. In fact, he has been considering joining the amish community, but is this the plan God has for him? Will a tiny Bible bring him back to the Amish culture or will he be an English man? The Midwife's Dream by Kelly Irvin is the last novella in this collection. Iris Beachy is a midwife who enjoys serving, but longs to have children herself. When she delivers a baby with a friend, she sees him differently. Will something bloom between the two of them as they care for this baby and find the right family? This novella collection is a wonderful addition to your collection of novellas. These authors are fantastic. ! I give this book 5/5 stars. A favorable review was not required for a review copy.